Fake tanning has become a fashion since people have turned out to be more conscious towards protecting their skin from extreme sun exposure, as this may host skin cancer and other corporal conditions. Fake tanning has become a fad these days, as it offers a safer way to tan or darken your skin color without being exposed to UV radiations. All thanks to self-tanners, spray tans and tanning beds; that tanning is not risky anymore; and now we all may have that beautifully sun-kissed glow all over our bodies without detaining our cells with scorching UV penetrations. Although Dubai has beautiful beaches that offers ultimate relaxing spell to allow the sun to kiss our bodies; however, we must not forget about the damage that the sweltering sun can cause to our skin. Our skin is so delicate, and we must not miss out pampering it while having fun time at the hot beaches of Dubai. The region is too sultry, thus you are recommended to embrace your super-hot bikini look when the sun is trifling and mild. However, if you are worried about how you are going to tell your friends that you had a super cool sunshiny holiday over the lovely beaches of Dubai, or may be concerned about receiving ‘you look beautiful in this sun-kissed hue!’; then ‘Fake Tan’ could be a great help at hand, because Dubai has an amazing pool of wonderful tanning lounges. Here listed are the top five tanning salon Dubai, that offers amazing sunless tanning products and services. Your life may not be imperfect, but your tan can be! The Sun Point Tanning Centre is absolutely your place that you have been looking for. It offers you an informative, efficient, hygienic, comfortable, private, efficient and just amazing tanning fun. It is one of the most famous professional tanning salon Dubai, that offers you amazing tanning services such as spray tanning, tanning beds and self-tanning products. So, Sun Point is the place that can make you Hot, when the Sun is Not! Sun Point is situated at the Trident Marinascape, Dubai Marina Walk No.12. Life is better in color! Right! So why not color your body. iTan Lounge is an amazing tanning salon Dubai, that offer indoor or fake tanning through tan bedding. It ensures that your body gets the right amount of tan that makes you look slimmer and sexier. iTan offers the best and the safest light to your skin while delivering a healthy and perfect tan. Stopover at iTan located in Nassima Tower, Mezzanine Level, Unit M03 – Sheikh Zayed Road, for your fresh tan hues this season. Hollywood Tans is another expedient layover for getting premium indoor tanning services in Dubai. 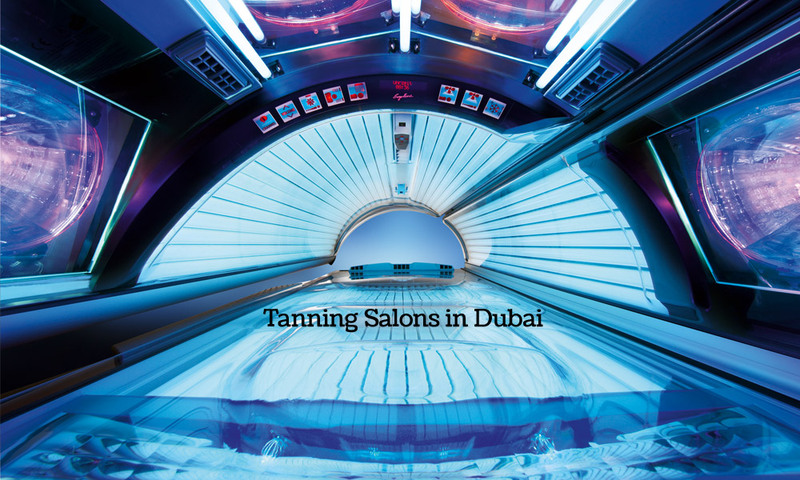 This is one of the finest tanning lounges in Dubai, that offers tanning and collagen services. Hollywood Tan uses an extensive range of the latest products and technology, including tanning booths and beds, red light therapy and tanning sprays & lotions. So go golden and glowy at Hollywood Tans located at Office 210, City Tower 1, Sheikh Zayed Road – Dubai. If you still haven’t found the one, you are looking for, then head towards Plush Tan, to get an allured tan looking with a healthy glow. Plush Tan is committed to offer you the perfect tan. All you need is to decide that Golden, Caramel, Latte or Chocolate! What you want to be this weekend and rush to Plush Tan while leaving the place feeling happy to get your perfect tan. Plush Tan offer Sunbed tanning and Sunless Spray tanning. To be a delighted Plush Tanner, head to Tecom Thuraya building facing Byblos Hotel –Dubai. Etolie is another finest tanning salon in Dubai, that delivers premium tanning services by using high quality products and latest techniques and technology. It offers spray tanning, manual application and double dip application along with sunbed tanning. Etoile Beauty Center & Tanning Studio is located at the Marina Walk at Dubai Marina. These are some of the best tanning salons in Dubai that you should try for a perfect tan skin. To recommend a tanning salon Dubai, as well as review about the above mentioned salons, please add comments below.